‘Only healthy body can support healthy mind’ is a well tested proverb for all times. To put this into practice the University has established a state-of-art gym & health club in an area of around 11000 sq. ft. 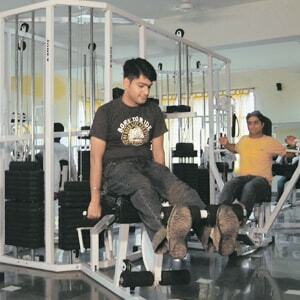 The Club has 31 workstations of highest quality comprising of Jogger/Cycle/Leg pull machine/Abdominal/Butterfly/Leg press/ Shoulder press/Bench Press/ Twister/Wrist curl with multigym facility supported by requisite audio system. Gym is also supported by locker facility to keep belonging of regular users.